“We live in a generation thirsting for spirituality,” says Rabbi Yakov Nagen, an interfaith activist and author who teaches at Yeshivat Otniel. Targum Shlishi is supporting the translation into English of Rabbi Yakov Nagen’s 2013 book Awakening to a New Day, to be published by Maggid in early 2019. Below is an excerpt from the book, preceded by a video of Rabbi Nagen and a short profile. More information about Rabbi Nagen can be found on his website and in this Wikipedia profile. Was the World Created Twice? The distinction between “Being” and “Doing” and their combination can be traced to the creation story. The Torah tells the story of creation twice; in the first chapter of Genesis the description of creation is divided into days, whereas in chapter 2, the story centers on the figure of Adam in the Garden of Eden. The traditional commentators found varied ways to understand the repetitions and differences between the two accounts (the outstanding examples in the previous generation are Rabbi Joseph Soloveitchik in his “Lonely Man of Faith,” and Rabbi Mordechai Breuer in his various writings). Some see the double description as an expression of the complexity of reality and its multiple facets, and others see different expressions for God’s providence over man and the world. I suggest that the difference between the stories as the difference between the fundamental existential approach to life as “Doing” as opposed to “Being.” These terms are not external to the Torah- they appear in the text itself, are the foundations of the Genesis narrative, and the relationship between them returns throughout the Torah. In its first description of creation, the Torah presents us with a story of “Doing.” Humanity is created in the image of God, and its purpose is to rule the world: “Be fruitful and multiply and fill the land and conquer it, and rule over the fish of the sea and the birds of the sky and over all living things that tread on land.” (Genesis 1:28) The language of creation is “that God created to do.” (Genesis 2:3) The second story, in contrast, describes an existential state of “Being.” Adam lives in harmony with nature in the Garden of Eden, and the rationale for Eve’s creation is that “it is not good for man to be alone” (2:18) In the former narrative, the connection of man and woman is aimed outwards- they must change reality through reproduction, and are commanded to multiply in order to fill and control the world. In the latter description, conversely, the connection of man and woman is aimed inwards, and the numeric direction is opposite- two become one: “And Adam cleaved to his wife and they became one flesh.” (2:24) Man and woman together answer the problem of human loneliness- the experience of oneness is the peak of their connection. As in the two descriptions of creation, the two approaches of “Being” and “Doing” permeate Jewish life. The Jewish week is divided into two: six weekdays of action: “Six days you shall work and do all your labors,” and afterwards, one day of rest: “And the seventh day is the Sabbath to the Lord your God, you shall not do any labor.” (Exodus 20:9-10) The obvious question is: Is the distinction between “Doing” and “Being” an admission of life’s duality, such that each value negates the other? Must we choose between a life of “Doing” and a life of “Being?” Are these two sides of our life impossible to bridge? At the beginning of Genesis chapter 1, God commands the earth to grow “fruit trees producing fruit,” but the earth grows “trees producing fruit.” (Genesis 1:11-12) Rashi, based on the midrash in Genesis Rabbah (5:11), explains: “Fruit tree—that is, that the taste of the tree would be like the taste of the fruit, and the earth did not comply.” The insubordination of the earth towards its Creator is known in midrashic literature as “the sin of the earth.” What is the significance of this sin? Why is it so important that the tree itself have a taste? Rav Kook (Lights of Repentence, 6, 7) explains the connection between the tree and the fruit as an allegory for the relationship between the “ends” and the “means”—the fruit represents the goal, whereas the tree stands for the actions taken to reach that goal. The Creator of the world intended that the pathway to the goal should have intrinsic value. In our imperfect reality, a tree is merely the intermediary to produce fruit. In the language of Rav Kook, the earth “denied herself.” Rather than dare to be herself, as God intended initially, the earth chose to realize herself only partially. Now, all our actions in this world are just steps towards a future goal. They lack existential meaning in and of themselves. An anecdote from Mark Twain’s classic novel, The Adventures of Tom Sawyer, illustrates Rav Kook’s teaching well. In one chapter, Aunt Polly punishes Tom by making him repaint the fence around their yard. Aunt Polly symbolizes the reality in which “the taste of the tree is not like the taste of the fruit.” Only the “fruit,” the whitewashed fence, has value, while the action of whitewashing, the path towards achieving the goal, is a punishment. Tom, on the other hand, in spite of (or perhaps because of) his youth, knows the secret of life that the path is not just an intermediary or a curse, but rather a blessing and privilege. With this insight he convinces his friends to pay him for the opportunity to whitewash the fence instead of him. In the language of spirituality, the highest aspiration is to “awaken.” The assumption is that one’s life can pass by while they are asleep. The duality of “sleep” and “wakefulness” relates to one’s awareness, the way they live their life. To a large degree, the lack of awareness of life stems from the wandering of a person’s mind back to the past or ahead to the future. In either instance, one is then not present in the one place where life actually passes—the present. As John Lennon once said, “Life is what happens to you while you’re busy making other plans.” A “sleeping” person is not present in the present, whereas only an “awakened” person succeeds in focusing and truly being present. Rav Kook’s interpretation of the midrash challenges us to achieve “wakefulness” not only when engaged in passive contemplation but in all of our endeavors, and not to allow a vision of the future blind us to the value of the present. Now we can understand Adam’s punishment at the time of his exile from the Garden of Eden. Eating from the Tree of Knowledge of Good and Evil produced within Adam and Eve a change in consciousness. Their eyes were opened to the knowledge of good and evil; everything in their lives was now either good or evil. This change in consciousness is also the punishment, reality did not change, only our perception of it. Immediately after the expulsion from Eden, God describes the existential struggle for humanity as “By the sweat of your brow you shall eat bread” (Genesis 3:19). However, “the sweat of your brow” is a curse only if we relate to it as such. Sweat and hard work can serve as the key to a meaningful existence, and in this context sweat is a blessing. Rabbi Nachman of Breslov refreshingly comments that the word “sweat” is compounded (in Hebrew) of the first letters of the verse in Psalms 118:24, “This is the day the Lord has made, let us rejoice and be glad in it.” (Likutei Moharan 2:6). 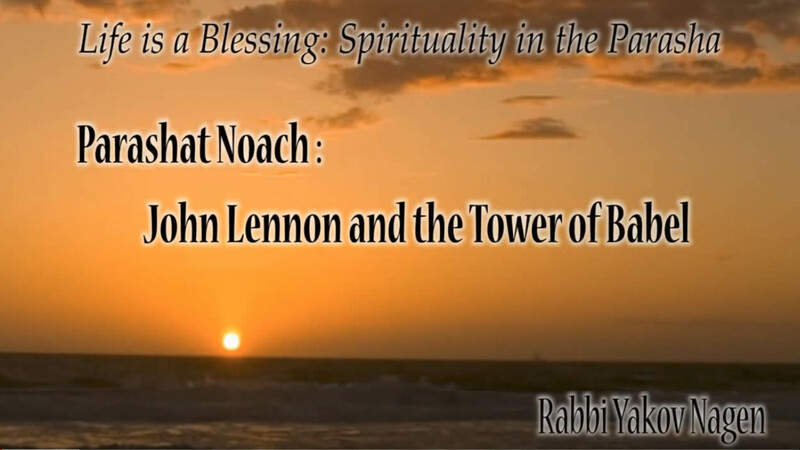 Specifically in the sweat Rabbi Nachman finds blessing and joy. If Eden was lost because of a change of consciousness, the way back is by returning to the primeval consciousness where “Being” and “Doing” are unified, where “by the sweat of your brow you shall eat bread” is not as a curse but a blessing. Existence here stems not from the duality of the Tree of Knowledge of Good and Evil but rather from the Tree of Life which accepts all life as a blessing. 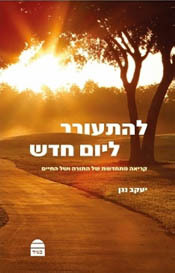 Images: (top) Rabbi Nagen; (in text) cover of the Hebrew version of Awakening to a New Day.